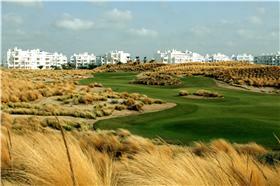 Saurines de La Torre Golf is a spectacular 18 hole par 72 course with a true desert style. Jack Nicklaus has created a course with features very similar to his most famous designs in Las Vegas. 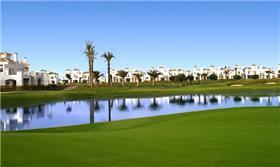 It is characterized by undulating fairways and greens between desert dunes, shortage of bunkers and a large lake of 6 acres. Not a single fairway bunker on the course you have to place your way between mounds of Pampas grass. 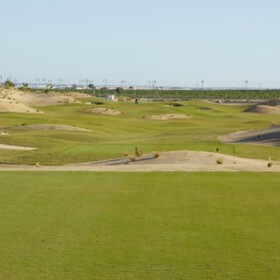 This is an exceptional golf course which after a slow start is rapidly becoming one of the best courses in this part of Spain – challenges Alhama & El Valle as the best of the Nicklaus design courses in Murcia. Hole Number 15th (stroke index 1) is as good as hole as you will see anywhere – water all down the left and in front of the green and no bail out right and 450yrds from the white tees. Still only a temporary clubhouse and no practice facilities at present – but their is an Irish Bar and supermarket in the commercial centre next door, despite this, this is a must play course if you are in the area.